The 1,320MW Balkhash coal-fired power project is being developed near Lake Balkhash in Kazakhstan. Image courtesy of Samsung C&T. The project is being developed as part of an intergovernmental agreement between the Korean and Kazakhstan Governments. Image courtesy of Samsung C&T. The 1,320MW Balkhash thermal power plant (TPP), consisting of two 660MW units, is being developed on the south-western bank of Lake Balkhash in Kazakhstan. The plant is expected to produce approximately 9% of Kazakhstan’s total power output. Construction of the first module began in September 2012 and the two units are likely to come online in 2019. Together they are expected to generate approximately 9,209 billion kilowatt hours of electricity a year. 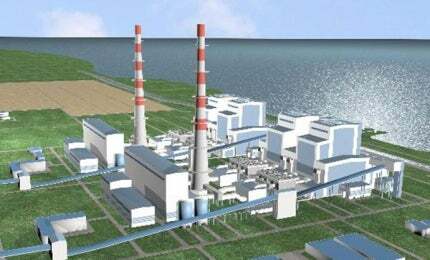 Balkhash Thermal Power Plant Joint Stock Company (Balkhash TPP JSC) is the owner of the power plant, which is being developed at an estimated cost of $4.3bn under a build, own, operate and transfer (BOOT) method. "Balkhash will use two Siemens SST5-6000 steam turbines of 660MW each." Balkhash is being developed as part of an intergovernmental agreement signed by the Government of the Republic of Kazakhstan and the Government of the Republic of Korea. The agreement, signed in 2011, includes economic cooperation in the field of financing, design, construction, operation and maintenance of the power plant. The coal-fired plant will be Kazakhstan’s first independent power producer (IPP) project, using foreign capital project financing for the construction and operation. Coal will be supplied from the Ekibastuz coal basin. Advanced coal technologies and equipment such as a gas treatment installation will be used at the plant to comply with environmental regulations and the EU’s emission standards. Balkhash will use two Siemens SST5-6000 steam turbines of 660MW each. It is also designed for the cogeneration of heat and power to achieve high fuel efficiency. The turbines will include a barrel-type high-pressure cylinder, an intermediate-pressure cylinder and up to three double flow low-pressure cylinders. The main stream is expected to have a temperature of up to 600°C and pressure level of up to 300bar. In addition, the SGen-3000W series generator is equipped with water-cooled stator windings to optimise the output and hydrogen-cooled rotor windings to achieve a higher current capability. The 5,000MW Waigaoqiao Power Station, located in the Pudong New Area of Shanghai, shares the distinction of being China’s largest thermal power project. Electric power for the thermal power plant will be provided by the 500kV Alma substation. All electricity generated by the plant will be delivered to the grid through the Alma Electricity Transmission Project, which will include the construction of a 500kV overhead transmission line from Balkhash TPP to YuKGRES substation and the rehabilitation of the 500kV YuKGRES substation. Kazakhstan Electricity Grid Operating Company (KEGOC) will purchase the electricity as part of a capacity purchase agreement. This was signed by the KEGOC and Samsung C&T in June 2014 for the construction and operation of the Balkhash plant for a period of 20 years. Samsung C&T owns 75% of Balkhash TPP JSC, while Samruk Energy, the national energy corporation of Kazakhstan, holds the remaining 25%. Korea Electric Power Corporation (KEPCO) will buy a significant share in the project upon request by Kazakhstan. A consortium of Samsung C&T, KEPCO and Samruk Energy are providing equity finance for the project, while debt financing is coming from commercial banks and export credit agencies in Korea, China and Europe. "All electricity generated by the plant will be delivered to the grid through the Alma Electricity Transmission Project." A joint venture of Samsung C&T and Samsung Engineering was awarded the engineering, procurement, construction and commissioning contract for the coal-fired power plant near Balkhash. Siemens will supply steam turbine generator units, two SGen5-3000W generators, control systems and other auxiliary and ancillary systems. Meanwhile, Dongfang Electric Corporation will supply a supercritical boiler. Black & Veatch has provided technical advisory services, while KEPCO will prepare the project feasibility report. Herbert Smith Freehills provided advisory services to Samruk-Energy for the power plant.